The two ladies to the right are probably both godmothers. Where then is the mother? Mothers did not customarily attend their children's christenings because a mother did not venture from home after childbirth until she had been "churched" ( a church ceremony of thanks). A perenially popular trumpet spill seeking a new home! Wow! Truly a vigorous piece of pot that fully captures the ferocity of the moment. 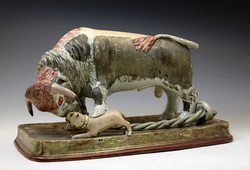 Note the bull's raised leg on the dog's back. 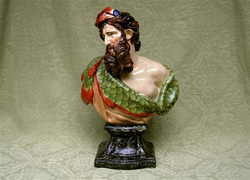 A fine bust of Neptune. I love the fish scales on his clothing! A lovely Return from Egypt. 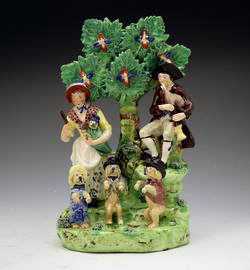 I have encountered only three Staffordshire figure models (well four really, if you count the Flight and Return as two) with this shield base. They may have been made by a short-lived pot bank, or perhaps they were a subset of the production of a larger manufactory. 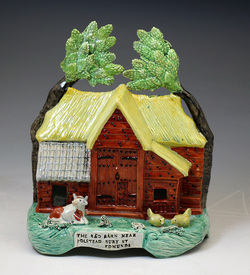 A very unusual Red Barn, attributed to the Patriotic Group. (For a full definition of this Group, see vol. 1 of my new book to be released in November.) I have only seen one other example of this particular Red Barn model. And yes, it was made without figures of Corder and Marten. This is an impressive model. 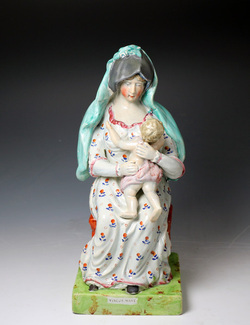 The Madonna sits on a four-legged stool, cut out from beneath to have free-standing legs. A title, and oh-so-pretty enamels. What more could you want? Hope. 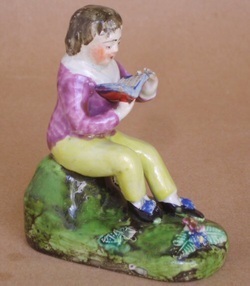 A Ralph Wood figure, so the enamels are lovely. Over 200 years old and still going strong! The most delicious example of this pair I have ever seen. 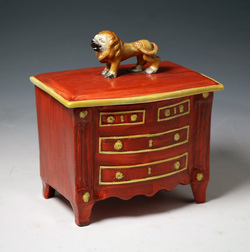 Nick and I both go weak-kneed when we see glazes and enamels that are this good. Ralph Wood figures of Simon and Iphigenia retain their haunting beauty after almost 240 years. Roger tells me Simon is impressed 96. Nice! 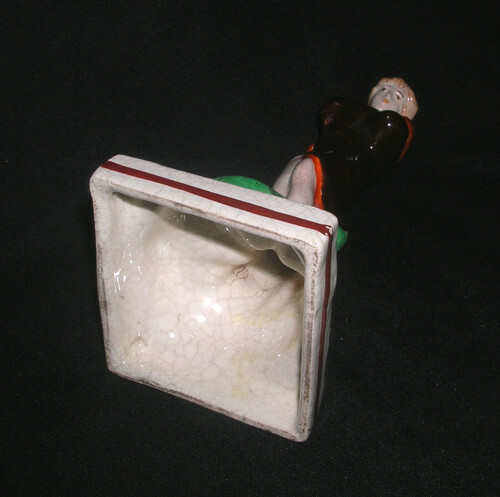 Andrew Dando's summer exhibition runs from June 8 to 15.
Who doesn't love teeny figures like this? They ooze charm! Very nice, Martyn! Hitherto, I haven't seen one of these with shell's on the base. The little lion normally resides on the base of dancing bear groups. In real life, the 'lion' in dancing bear acts was a dog dressed in a costume that included a raffia wig! I think sweet figures like this are ridiculously cheap. 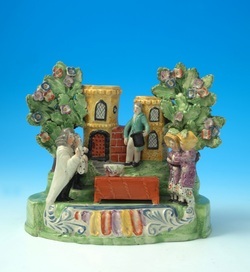 New at Castle Antiques, and marked "WALTON"
And you can see another like it in my book, People, Passions, Pastimes, and Pleasures: Staffordshire Figures 1810-1835. 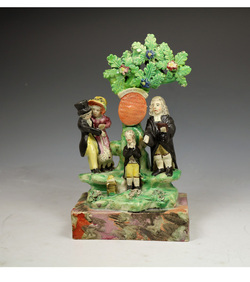 On eBay and described as "rare18th century Ralph Wood"
And to top it all, the figure is described as having "nice bocage decoration". Am I missing something...or is the figure?? Yes, a very pretty base. 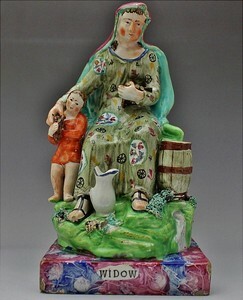 Described as "Staffordshire first half of the 19th century." You will also find a group just like this on the REPROS tab of this site! Currently on John Howard's site. 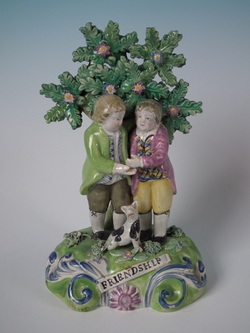 See similar in People, Passions, Pastimes, and Pleasures: Staffordshire Figures 1810-1835. 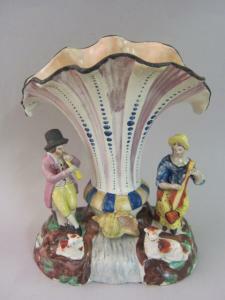 "In this market, even figures of Jobson and Nell are rare".....from a leading ceramics dealer! 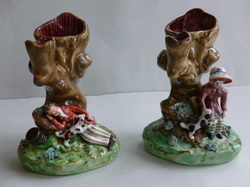 The figure group and stirrup cup alongside are reported as missing, possibly stolen. If you see them, please contact me. 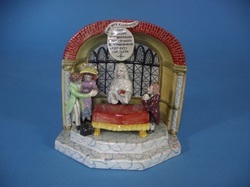 Available from Madelena. One of my favorite groups! Currently on Roger de Ville's site. Watch out for these! 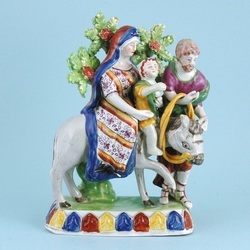 I have seen three listed as The Real Thing by auction houses in the past weeks. Shame on them! 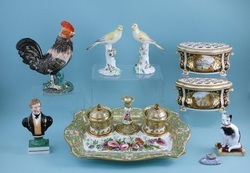 January is time for the New York Ceramics Fair. I didn't manage to capture the image off the web site very well, so go and look for yourself. I can't wait to get there! 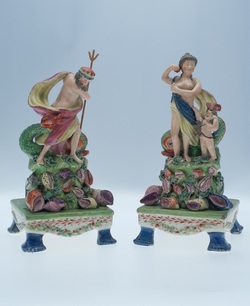 Described on eBay as circa 1835. No, no. 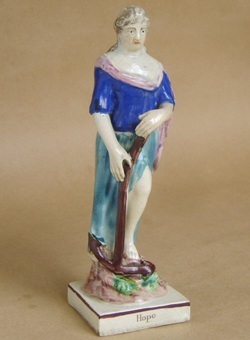 This figure is a later copy. The color or the green is a give-away. Also notice that the interior is smooth and undulating, as if the clay was poured into it in liquid form. It was! 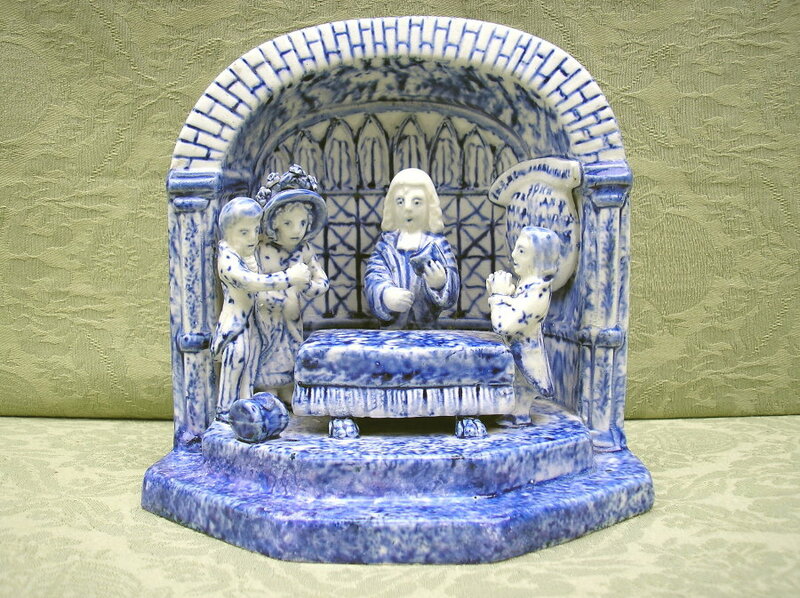 This is slip poured, whereas early figures are press moulded. Described as in good condition with restoration to the enamels...but that right side of the bocage is restored too. See it on eBay. A little book worth having. Now on eBay. Described on eBay as a lady carrying a baby....surely this gentleman holding a wheat sheaf is the well-known representation of Summer? The "Tunstall Group" is the title given to figures with shared features linking them to shards excavated from a site in Tunstall, Staffordshire. 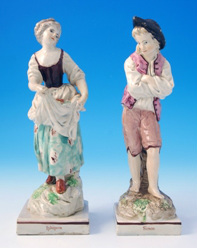 This figure (currently on eBay) can also be attributed to the "Tunstall Group." The bocage flower visible on the left is quite specific to "Tunstall". Other clues are the manner in which the bocage fronds are formed (each frond has five leaflets with stubby points) and the typical base. Who was the potter who worked at the Tunstall site? We don't know his name, but there are several possibilities. 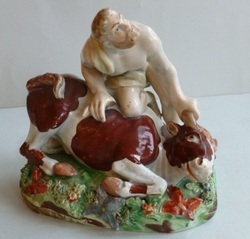 You will be able to read all about it in my book on Staffordshire Figures 1780-1840 to be published later in 2013. 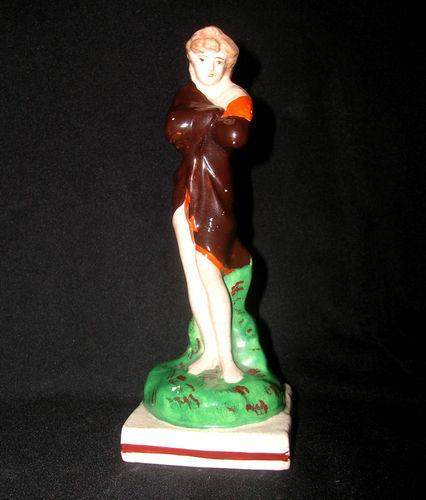 I would attribute this figure (currently on eBay) to Ralph Wood--although it is not quickly recognizable as such. My reasons: the bocage leaves are typical, as is the black line painted high on the base. And, significantly, the line goes around three sides of the base only, not on the back. I suspect that the base viewed from below has rounded internal corners. I have seen this figure before, accompanied by a similarly styled girl to pair. Andrew Dando's Exhibition is available online from noon UK time on Saturday December 1. I know several collectors who pounce as the Exhibiton hits cyberspace. My iPhone and iPad start pinging with their email questions at 7a.m. US east coast time! Click here for Andrew Dando's site. I enjoy having this book on my bookshelf. An old favorite. John Howard has the earliest phrenology head I have ever seen. Phrenology, a 'science' popularized after the end of the eighteenth century, believed that different parts of the brain controlled different capabilities and emotions--and the larger your zone for that attribute, the more you had of it. Zone 8 on the left of this head is "Acquisitiveness". Collectors probably have big zone 8s! Click here for John Howard's site. 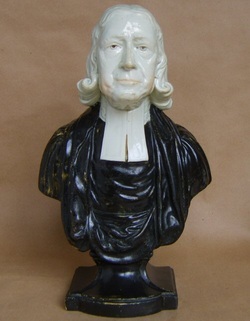 This very reproduction figure is on eBay, described as "R. Wood school." There is no direct mention of its age, and there is nothing Ralph Wood about it--even the mark beneath is not the mark of our early potter. I haven't seen this eBay figure before. Far from cheap...and is that disclored area on the tail restoration?